24 October 2011: In the early 1990’s Guangzhou, China’s third-largest city, was becoming dysfunctional as economic and population growth was matched by pollution and gridlock growth. But the construction of the Guangzhou Metro has made the city one of the most mobility friendly metropolises in the world. By 1992, planning for a first line was at an advanced stage and construction began in 1993. The initial 5.4km section of Line 1 opened in 1997 and linked Xilang with Hangshwa along an eastwest corridor. In 1999 it was extended to Guangzhou East rail station and traversed 18km with 16 stations. Line 1 was procured and delivered through a turnkey contract with Siemens although the trains were bought from Adtranz, now part of Bombardier. It cost 12 billion yuan (US$1.87 billion) and was then the most expensive single project ever procured by the city. In 2002 the first 23km phase of Line 2 opened, a year ahead of schedule, The route was extended in 2003 and again in 2005. This was a start but by then the population was growing rapidly as the Pearl River Delta had become the workshop of the world. A boost to the rate of funding and constructing modern mass transit was needed. And then the second key event happened. In 2004 Guangzhou mayor Zhang Guanghang and his colleagues decided to bid for the 2010 Asian Games and at a meeting of the Olympic Council of Asia in Doha. Their bid was successful and Guangzhou was awarded the games. Guangzhou Metro Corporation and the municipal government were now able to access a much faster flow of investment capital in the context of the Games, the greatest opportunity to showcase itself the city had had since before the communist revolution. Wan Qingliang, who succeeded Zhang Guanghang as mayor in early 2010 confirmed before the games began that expenditures on it were within budget. Within budget or not, 109 billion yuan (US$17 billion) were invested in urban infrastructure projects in the previous six years. The majority of this, around 70 billion yuan, was invested in the metro expansion. On 8 November 2010, four days before the Games began, the last part of a massive phase of development was in place when services began on the Chigang Pagoda  Linhexi people mover, a 3.9km driverless system built to serve the central business district in the Zhujiang New Town district. Line 2 and Line 8 have been re-organised. Line 2 is now a 32km north-south line across the city, which incorporates a new northern extension to outer suburbs and terminates at Jiahewanggang. Line 8 is now an east-west line of 14 kms linking Fenghuang Xincun with Wanshengwei. By November 2010 the Guangzhou metro network totalled 236km with 144 stations. There are 8 lines. And not all of them are limited to the city and environs. The network had expanded by 170km in five years. The metro system now reaches into the outer suburbs of the city and beyond the city boundaries. And this dramatic surge in investment recognised that both reach and interchange are important in an effective urban transportation network. Guangzhou’s massive 1990s airport in Baiyun, a large district in the north of the city, has been served by line 3 since October 2010. There are two stations there. This cross-city underground line now traverses 67km. It is a Y shape with a north south trunk and a spur to the east so it serves a high proportion of the principal locations including Panyu Square, Zhujiang New Town, Guangzhou East Station and Tiyu Xilu. Journey time for the 28km between the city centre stations and the airport is around 40 minutes. Interchange with line 2 at Jiahewanggwang in the south of Baiyun provides convenient travel between the airport and the Guangzhou South High Speed Rail Station on the opposite edge of the city with a single transfer. The key hub for the future for Guangzhou and the whole of the Pearl River Delta is this Guangzhou South facility which opened in January 2010. It is the southern terminal for high speed train services across Guangdong province and on in to central China. The 968km very high speed line between Guangzhou South and Wuhan is used for 50 services a day. From 2015 the hub will be connected to Hong Kong in 48 minutes when all elements of the new express rail line through Guangdong to Kowloon in Hong Kong are completed. 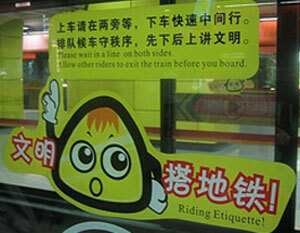 Currently, it is served by the new Guangzhou  Zuhai inter-city railway and by other Guangdong inter city routes. 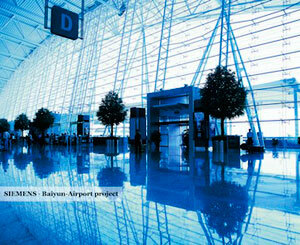 Constructed between 2007-2010 at a cost of 12 billion yuan, it has a 68 metres roof span over 28 platforms. Current capacity is 200,000 passengers daily and the design allows for expansion to 300,000 passengers a day capacity. The design team was London based TFP Farrells, Beijing Institute of Architectural Design and Fourth Railway Survey and Design Institute. In July 2010 the new southern extension of metro line 2 to Guangzhou South Station was opened. In future the station will also be served by planned lines 7 and 12. Phase 1 of line 7, which will connect Guangzhou South with more of Panyu district, the major higher education hub in the southern part of the city and more interchange points is likely to be constructed by 2016..
Building continues with lines being extended to the outer suburbs and more new lines so that by 2015 the metro system will exceed 300km. Two more new lines, lines 6 and 9, are being constructed and are due to open by 2015. Construction of the 20km line 9 connecting Guangzhou North rail station with Huadu and Gaozeng began in summer 2011. The Guangfo line, also known as line 11, will be extended by 10km within Guangzhou from Xilang  Lijiao. It will then be 33km long with 21 stations. The extension is set to open by 2013. The Guangfo line was jointly sponsored and is jointly owned by Guangzhou City Council and Foshan City Council. It is China’s first underground metro line to connect two significant urban centres. Most of the first phase, which opened in 2010, is in Foshan. The two cities have agreed to build a second cross-city metro line which should begin construction in 2015. Estimated investment in Guangzhou Metro in the decade 2005  2015 is over 100 billion yuan. In an address to the City Reform and Development commission in February 2011 mayor Win Qingliang said overall rail network investment between 2011 and 2016 would be 63 billion yuan (US$9.8 billion). Twenty billion of this would be on the first phase of line 7 and the first phase of line 9 of the metro system. A further 11 billion yuan is earmarked for phase 2 of line 6 expected on site in 2013. Around 50% of the funds will come from bank loans. And with the population rising so quickly it will not end there. In 2010 the population was officially 12.7 million and mayor Win Qingliang even speaks of 15 million in his speeches. With the opening of more roads and fast rail lines connectivity in the pearl river delta is improving and with manufacturing activity continuing to be strong the numbers of more transient residents continues to increase across the whole area. The opening of the high speed line services to Kowloon, Hong Kong cutting the journey time to 48 minutes in 2015 will also probably increase business and residential re-location. Economy and tax revenues permitting there are firm proposals for another five new lines totalling 190 kms and further inner and outer suburban extensions to five of the existing lines. If all these projects go ahead in the 2015-2022 period, as currently envisaged Guangzhou will have a metro system of approaching or even exceeding 600 kms by 2020. 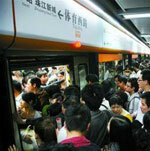 In 2010 the system carried 1.18 billion passengers. The vast numbers carried during the Asian Games when use of the system was free significantly contributed to the total. The daily average in May 2011 was 4.4 million. If this is typical the 8 lines will cater for around 1.6 billion journeys in 2011. This catapults Guangzhou in to the top ten metro cities of the world. A contactless smart card system, the Yang Cheng Tong, is in place in the city region. Single journeys cost between 2 and 14 yuan. All of the lines are 1435 mm gauge and are a mixture of overhead line and third rail power. Late in 2010 the Guangzhou Metro Corporation owned just over 1000 vehicles though this will increase sharply by 2015.